The Wacker Neuson attachment broom type 520 dual is easily attached using the Wacker Neuson quick exchange attachment plate. It is especially developed for the requirements of street and winter services. 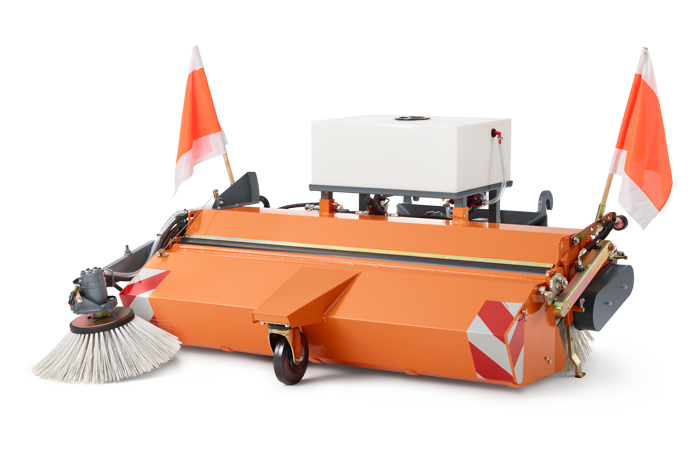 For cleaning large parking areas and wide streets this broom is the ideal attachment for Telehandlers. With the extra side brush and the water sprinkler this attachment extends the application range of your Telehandler. Available as standard in orange RAL2011. drive unit integrated in housing. parallel compensation for optimum guidance. bristles made of durable material for low wear rate. scale control of the broom setting. individually adjustable sweeping roller pressure by stepless adjustment. Wheels: heavy duty Ø 200 x 50 mm / 7.87 x 1.97 in. various sweeping roller made of PPN or steel with spiral segments. water spray system 100 liter and water spray for side brushes. various hydraulic side brush made of PPN, steel or steel flat wire. hydraulic pivoting device for 4th control circuit. flag holder incl. warning flags and warning signs. All options are available for all variants of the equipment from 1250 to 1800 mm working width.